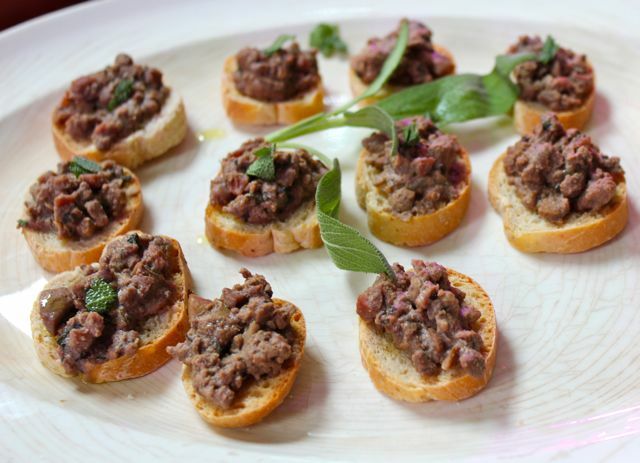 Some rustic chicken liver pate with sage to gnosh on while all the hubbub was going on. I noticed several ingredients from Gejo gracing the plates… from stunning flat leaf parsley to tomatoes to sage, etc. 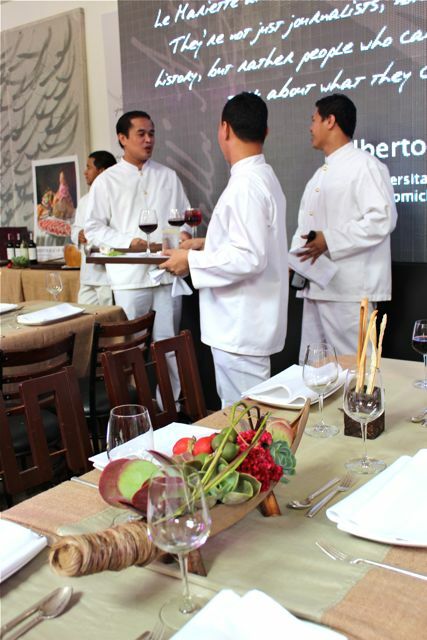 Waiters in white offering wines from Bacchus, a co-sponsor, and some gumamela or hibiscus iced tea. 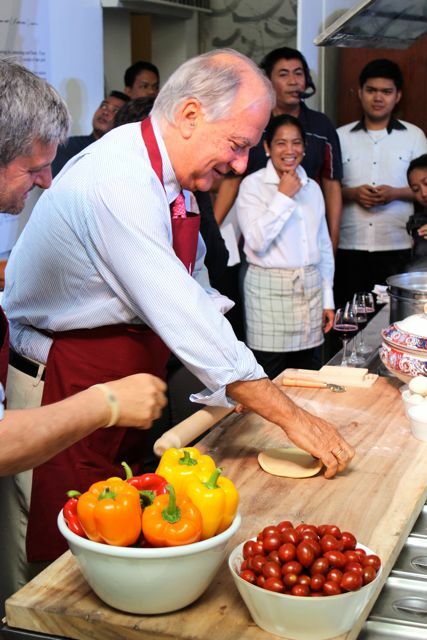 The Italian Ambassador to the Philippines, Luca Fornari, trying his hand at making fresh pasta while the Mayor of Forlimpopoli, Paolo Zoffoli, looks on. 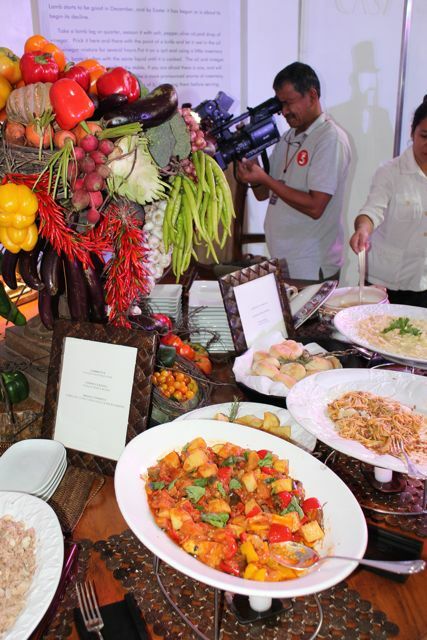 …followed by a buffet featuring several kinds of pasta, vegetables, tuna and beans, soup, etc. all mirroring some of the classic recipes described in Pellegrino Artusi’s cookbook, The Art of Eating. 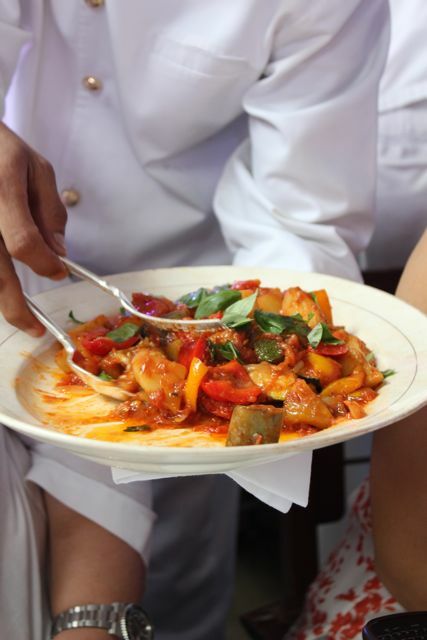 We started with a Ciambotta, an Italian vegetable stew, quite close to a ratatouille in concept. We also had a classic tonno e fagioli or tuna and beans with a particularly refreshing dressing of lemon (but lots of it) and some olive oil. 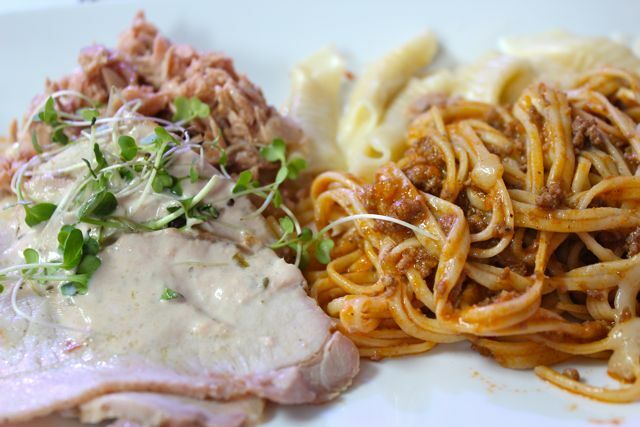 Instead of a typical veal or vitello, a platter of pork loin with tuna sauce or maiale tonnato appeared on the buffet table, topped with some micogreens. For pasta there was tagliolini Bolognese and garganelli with tallegio cream. I didn’t have any of the cappelletti in brodo, but it certainly looked and smelled wonderful. One of my plates… I have to admit, I went back for more… :) And below a snapshot of the little boneless and stuffed lechon, and served with a light sauce au jus that was delicious! It was a wonderful light(?) and delicious lunch. And went home with a wonderful box of Italian chocolates. Margarita is a good, good friend, so yes, you might say I am a biased observer and guest at her event. Nevertheless, I don’t know many people in Manila who can pull off a lunch like this one, let alone be asked to partner up with Casa Artusi to open up a school here in the Philippines. So Brava Margarita, Brava!! Hi Mr. MM, what a treat! 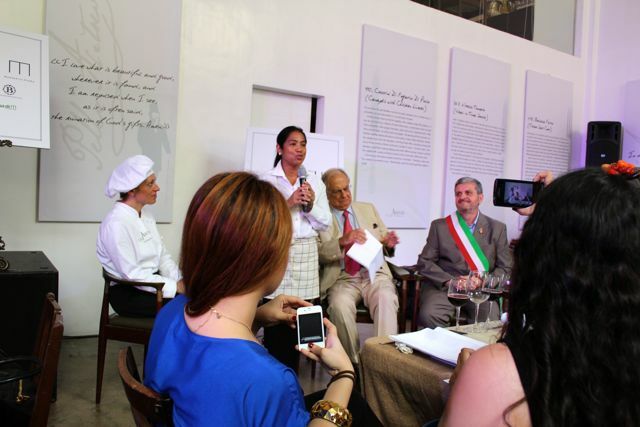 Casa Artusi in Manila soon! I am intrigued by the caperberries, where can you buy them? A great day to you .^_^. beautiful, just beautiful! thanks for sharing, MM. i doubt that the dailies and weeklies and monthlies would be able to do better than this post. So well-presented—more beautiful than some food magazines! Brava Indeed!! so beautiful..everything!! 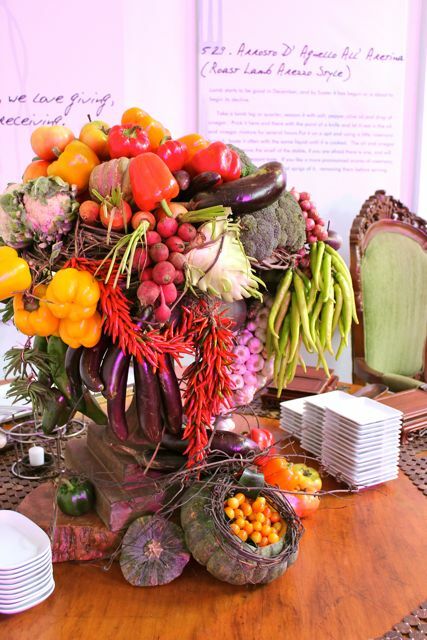 Love the Vegetable centerpiece..love everything!! MM, they chose the right person to partner with. How can they go wrong with Ms Fores who has long given us excellent Italian food? I used to frequent Cibo when I was still based in Manila and now that I am based elsewhere, I never miss going there when I’m home! Several Italian colleagues/friends that visited Manila loved Cibo (and Lusso for that matter) so I suppose my judgement is right! Can’t wait for this school to open! And btw, got home 3 weeks ago and been to Cibo 6 times already! 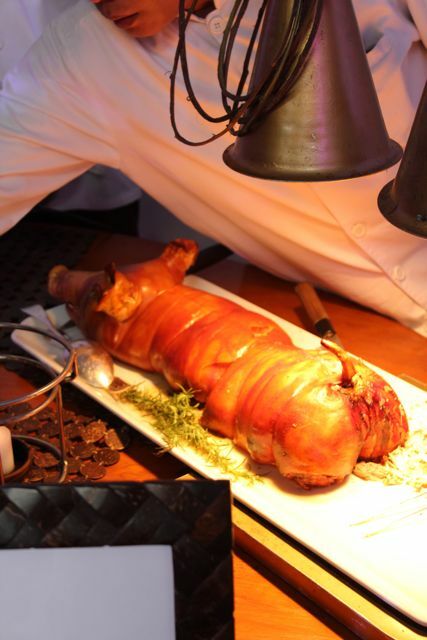 The lechon is very cute!!! Great! 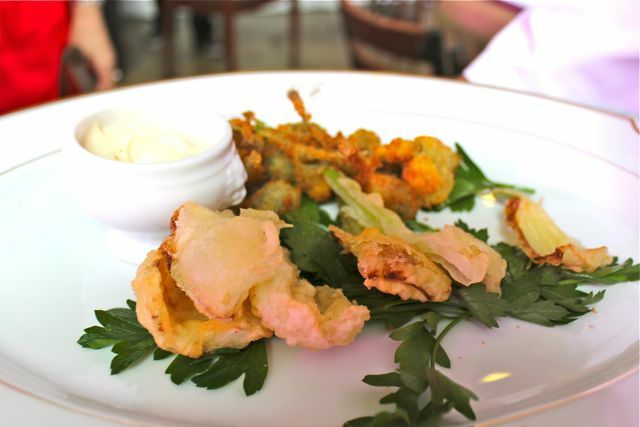 With the Fores partnership, we can expect a cooking school that’s more focused on taste than presentation. Am not saying Fores food is lacking in that aspect, but sadly, so many chefs/schools nowadays are obsessed with presentation. @MP, Tempting to apply folk etymology to the Filipino canto-slang tsibog, to eat. Sounds as though it came from the Italian cibo which descended from the Latin cibus, food. By what route, hard to tell since we already have sebo, congealed fat, that we got from the Spanish cebo which ultimately also goes back to the very same Latin cibus. CONGRATULATIONS to Margarita Fores yet again! 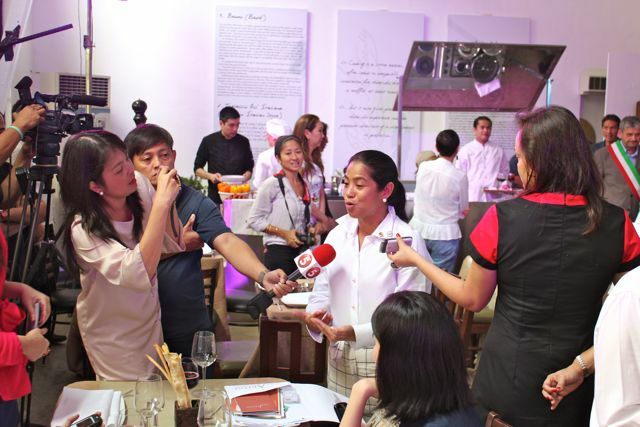 MM, can you tell Margarita to bring back Cafe Bola in Makati? Pretty please? The last sentence can be cajoling. But coming from you MM, such praise is endearing. So i repeat; Brava Margarita!! Brava!! After reading your article, how I wish I am again in that sweet junction in life where one chooses a carrer education. I would have a go for a degree in culinary. Marketman, your website isn’t displaying properly on my browser (Safari). I’ve not had a problem before, and have tried refreshing/reloading to no avail. Such a gorgeous centerpiece. So unique and colorful. I think it had more effect, giving the place a homey feel. Boneless lechon? So convenient.. hope it was tasty too. Hi MM, sorry to be off the topic ;) just wondering if the format of marketmanila changed, it’s different now in all our computers at home. Thanks!! Reading your blog is certainly a feel-good thing :) reading the comments is definitely the cherry on top! 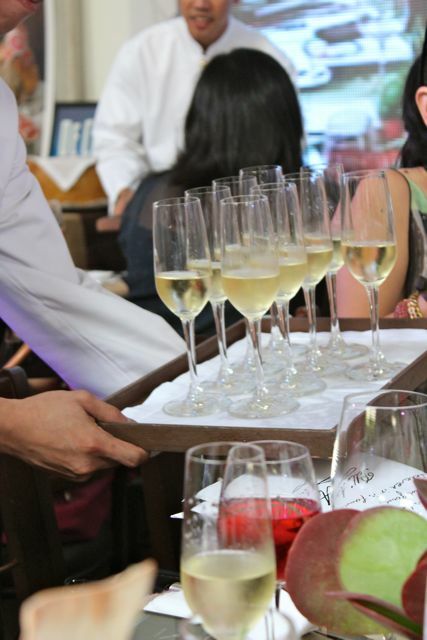 everyone’s passion for food is undeniable and absolutely contagious! Hi Footloose, I have to admit it never occurred to me that Cibo may be remotely connected with tsibug or that one is a derivative of the other! Hi MM, no, the site hasn’t gone back to normal for me. How do I send you a screenshot of what I’m seeing on my browser? Hi! I’m interested to take up culinary with Casa Artusi. Do you have any contact details? Many thanks! Salud! What a feat indeed. Ms. Gaita, you’re a bundle of joy and your gastronomic feast is a wonderful example of a splendid shower of firework display, it topped the jubilee celebration in the UK! You do us proud:D Cheers! armie and jennifer, I don’t think the school opens for students until January or so next year. I will post details as soon as I get them… Thanks. Chico / Sapodilla – In Season Now!! !